Carson Sink, Nevada, by Timothy O’ Sullivan. 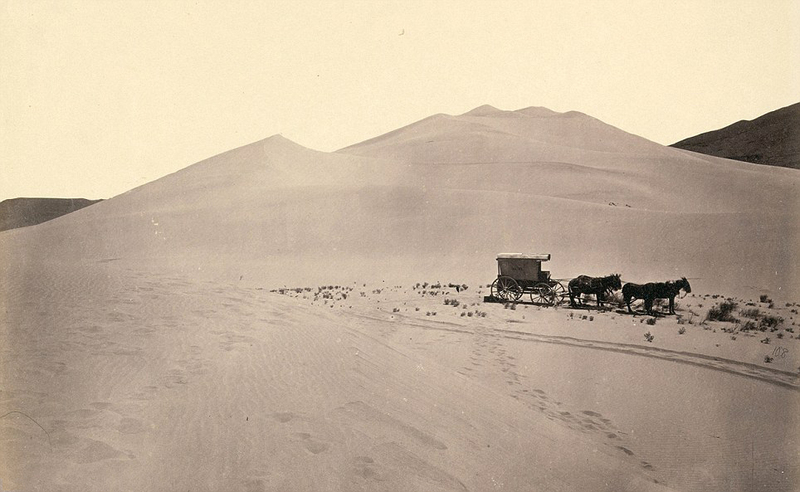 A photographer’s wagon stands stock-still, arrested in the midst of a long drag across the wide-open reaches of America. Four mules – famous for their bloody-mindedness – have swerved from their trajectory, doubling back along their plodding tracks. The wagon’s U-turn is marked in a great double sweep along the ground, a double swathe of sand displaced by the wooden wheels. All around these features, containing them much as a canvas might contain a few brushstrokes, is a landscape of surpassing blankness. This is Nevada, but it could be Egypt, Syria, or Lebanon: a great empty topology, nearly as empty as the sky above. The shapes upon the earth are legible only thanks to tonal contrast. That is all that black and white photography affords, of course – the same chemistry which yields the silhouettes of animals, wagon, tracks, and scrub grass. The ground is so featureless, however, that it prompts thoughts of way the image is built up. One can almost feel the slow deposit of particles accumulating on the flat substrate of paper, creating an impression of depth, much as windblown sand continually builds the surfaces of rolling, textured hills. And then we notice a feature in the foreground, cutting right across this slow drama of emergent, horizontal figuration, leading right up to the camera’s position, and hence our own: another set of tracks, those of the photographer himself. (Or are there two sets? Perhaps his assistant struggled up the hill alongside him.) No attempt has been made to erase this passage, to un-disturb the terrain. Not surprising, really, since the subject of the picture seems to be that of operating on difficult ground. Timothy O’Sullivan, the man who made this image, was among the first photographers to ‘go West,’ and certainly the most ambitious. In the early 1870’s he carried his kit across miles of thinly populated country to capture craggy mountainsides, scrappy mining settlements, traditional Native American communities. In this one photo, however, his objective was different. Like a general turning his attention away from the front in order to assess his supply lines, O’Sullivan shows us the efforts required to make his work. His pride was justifiable. Photography then was a new medium and an extraordinarily cumbersome one, difficult even to imagine in our own day of convenient pocket-portability. Today we might take three, five, twenty pictures of an only slightly interesting subject, knowing that we can delete them later. For O’Sullivan, every photograph was extracted from the world only with difficulty. That lends this mule-and-wagon picture another layer of meaning: for it prompts the question, ‘why this spot?’ What was it that made O’Sullivan go to the trouble of turning his wagon around, so that he could record this particular place? At a stretch, we might guess that he saw a promising composition in this patch of earth – the asymmetry of the mounds’ silhouette, with two dark patches of background setting the lighter foreground in relief. But for me, the point of the picture is that the terrain is unremarkable, unspecific. I like to imagine that he could have obtained a similar image at any point for miles east or west. That vast tract tacitly frames this image as one of arbitrary decision-making. Nothing visible in the shot prompted O’Sullivan to take it. He simply stopped – and took a picture for no good reason at all, except that of literal self-regard. Of course, as we Americans have belatedly come to admit to ourselves, the space of the Wild West was not so blank after all. It was inhabited ground before the settlers got to it, and the tragedy that befell the Native Americans should not be far from our minds when we look at O’Sullivan’s work. He is no villain in this regard – he may have been proud of his achievements, but as I have mentioned, one of the most striking aspects of his work was the way he captured, even-handedly, the mixing together of peoples out on the frontier. Even so, we might recall here Susan Sontag’s observation that ‘A photograph is not just the result of an encounter between an event and a photographer; picture-taking is an event in itself, and one with ever more peremptory rights – to interfere with, to invade, or to ignore whatever is going on.’ The American campaign of westward expansion was undertaken not only with wagons and guns, but also with images – both photographic and painterly – which cumulatively framed natural space as prime real estate. Those other pictures typically lacked the self-awareness of the photographic act contained in this picture. And certainly, they depicted nothing like the U-turn seen here – a motif that suggests a doubt quite alien to the ethos of manifest destiny. O’Sullivan captured at least one moment when the photographer asked himself, for whatever reason, ‘what am I doing here?’ And today, when the patch of earth he shows us here might well be covered over by a roadside K-Mart, it gives us a way to imagine what might have been otherwise. Glenn Adamson is Head of Research at the Victoria and Albert Museum. His new book, The Invention of Craft, is published by the V&A in conjunction with Bloomsbury. Posted on April 9, 2013 December 8, 2016 by vsmallfires	This entry was tagged Timothy O'Sullivan, Wild West. Bookmark the permalink.